Laolu Akande, Abuja: Vice President Yemi Osinbajo, SAN, has called on political leadership in the country to commit themselves to doing something collectively and individually that can alter the ways things are done in Nigeria for good. Prof. Osinbajo was speaking earlier today when he met with a delegation of lawmakers from the House of Representatives in his office to discuss the economy and particularly possible ways of navigating Nigeria out of recession. The federal legislators who called on the Vice President are members of the Tactical Committee on Recession from the House of Representatives and were led by Committee Chairman, Dr. Bode Ayorinde, in a visit that promoted cordiality and progressive synergy between the National Assembly and the Presidency. Budget and National Planning Minister, Senator Udoma Udo Udoma was also at the meeting. 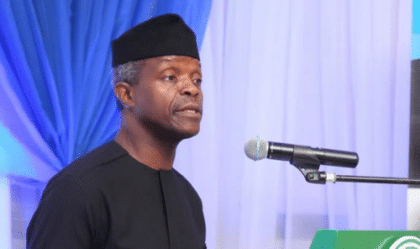 Speaking on the need for political leaders to use their positions and the leadership opportunity to effect changes that would benefit the citizenry, Vice President Osinbajo said leadership was a call to service. He said: “we need to address the fundamentals of that abnormality. If we do not address it, no matter what we say, things won’t work. The Vice President in response to issues of revenue allocation raised by the visiting legislators noted that emphasis must shift from ‘sharing’ to generating more revenue internally, including in the States. He also assured that the Federal Government is actively exploring options on how best to liquidate the debts owed contractors across the country, including the option of using bonds. Speaking on behalf of the legislators, Dr. Ayorinde said some of their areas of concern include the foreign exchange policy and its impact on manufacturing, calling for a review. He said the Tactical Committee was ready to interface with the Economic Management Team and commended the team for all its efforts to revamp the economy including the recently released Economic Recovery and Growth Plan. Earlier the Vice President chaired the meeting of the National Innovation and Research Council attended by several ministers from the Ministries of Science & Technology, Budget & Planing, Education and Justice. Representatives of the Manufacturers Association of Nigeria, MAN were also in attendance. BUYERS CAN ORDER A MINIMUM OF 100BAGS,TRAILER LOAD OF 600BAGS,TRAILER LOAD OF 900BAGSS AND ABOVE,CONTACT THE SALES MANAGER MR OJEKERE ON (070653/83208) OR ASSISTANT SALES MANAGER MRS MARY ON (0813206/6217) FOR INQUIRIES.